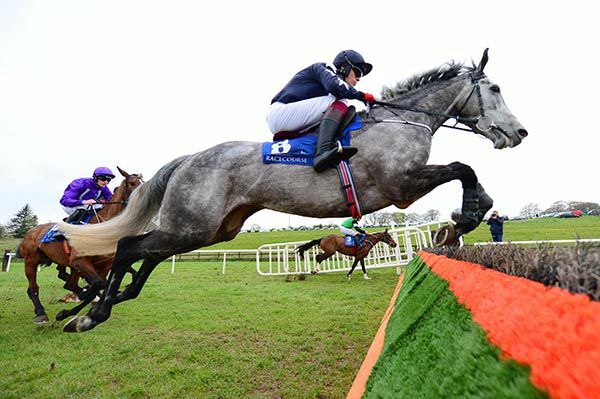 Uhtred absolutely thundered home in the final furlong to get up and land the Tattersalls Ireland George Mernagh Memorial Sales Bumper at Fairyhouse. The 4/1 favourite gave Joseph O'Brien a first and last-race double on the card. Uhtred had a colour change and sported the second colours of Gigginstown who recently purchased him. He was fully 10th racing around the home turn with three furlongs to go and was switched out by Tom Hamilton entering the home straight. He was ridden coming to the final quarter of a mile and made good headway to fourth passing the furlong pole. The son of Fame And Glory rocketed home to get up in the closing stages to win by three parts of a length. Chuvelo (18/1) was the horse in second who was mowed down by the winner. Fantasio D'alene, in Gigginstown's first colours, finished third at 14/1. Joseph O’Brien said: “I think he got tightened up at the start and ended up a bit further back than we had expected. It was obviously a messy enough race but he quickened up well. “He was bought (by Gigginstown) just in the last few days. He’s a well-bred horse by Fame And Glory and you would be fairly impressed when they do that first time out. He has an engine and has been working nicely. Galilean went for home before the last in the two mile maiden hurdle at Fairyhouse and forged on strongly to score under Mark Walsh. The pair looked to have a battle on their hands as Mr Everest loomed large on the outer after the second last, however, he could make no impression at the business end. Some nine lengths separated the 4/1 winner from the 9/10 favourite. Calicojack was a further six lengths away in third at 9/1. Joseph O’Brien said: “He jumped well enough and he stays well. He probably ran to a similar level that he did the last day. It’s nice to get a winner here. Isotope (8s into 7s) carried across progressive Dundalk form to make a winning debut on turf in the Racing Home For Easter Festival Handicap at Cork. Shedding his maiden tag at the sixth time of asking, the O'Brien family owned/trained and ridden son of Footstepsinthesand prevailed by a neck and two and three parts of a length from Bodhicitta and Pensylvania Avenue. Third at Dundalk at 100/1 on his previous outing, this time Aaron Boy was a 50/1 chance and he filled the fourth spot, three and a half lengths back. Isotope tracked the leaders on the outer under Donnacha O'Brien, and he was third at the halfway stage. Pushed along early in the straight the Joseph O'Brien-trained three-year-old was ridden to lead a furlong and a half out. Soon strongly pressed Isotope was under pressure and kept on well inside the final furlong to gain the day. Hugh Horgan steered his first winner on Rockfish at Dundalk today as the 17 year old son of former leading jump jockey Trevor Horgan landed the concluding Light Up Your Night Handicap for his cousin and trainer Joseph O'Brien. Horgan junior was having his 21st ride tonight and steered Rockfish to a half length win over Bruinneall. The winning pair had raced in mid-division, with Horgan making his move in the home straight as he improved Rockfish to lead under a furlong out and eventually score his memorable win. 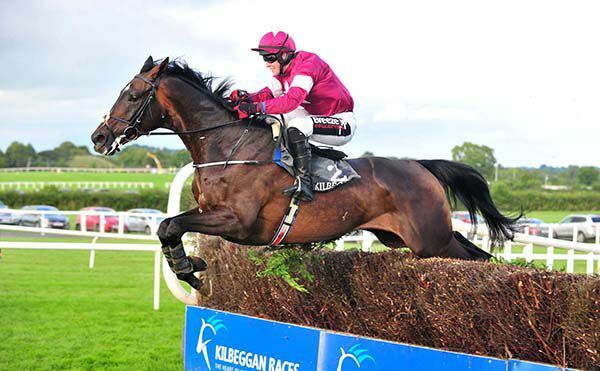 Horgan is the son of Galway Plate winning jockey Trevor Horgan, whose career was ended prematurely by injury in 1997, and is a cousin, through his mother Breda (nee Crowley) of Rockfish's trainer Joseph O'Brien. Following the race today's winning rider stated “Joseph has been very good to me. I went in there two years ago and every day I learned something new. I’ve had 20 rides now and I’m very grateful for all the help he has given me. There were joyous scenes before, during and after the running of the concluding Racing Next On April 29th Handicap at Naas today as the youngsters of the newly formed Blackrock Racing Syndicate enjoyed a slice of beginners' luck with the Joseph O'Brien trained winner Arthurian Fame. Ridden by jockey Donnacha O'Brien, who was completing a double on the day, Arthurian Fame was held up in mid-division for much of the race before being produced on the outer to lead with a furlong to race. The pair eventually went on to beat runner-up Ciao by two lengths. Excited syndicate member Dylan O'Reilly had been interviewed on RacingTV prior to the race and admitted the group would “give it socks” regardless of the result and while every mention in-running of 'Arthurian Fame' was met with a loud cheer, the start of the race was equally celebrated by the group. Passing the winning line, racecourse commentator Jerry Hannon gave the group a 'shout-out' exclaiming “the place has come alive” and afterwards winning trainer Joseph O'Brien was later lifted shoulder-high in the winners' enclosure by the former students of Blackrock College, each wearing blue and white scarves. The money came thick and fast for Gipsy Lee Rose and she delivered in the opening National Student Raceday Mares Maiden Hurdle at Limerick. Shane Shortall donned the silks of young horse producer Alan Harte on the grey daughter of Walk In The Park, and she was backed from 2/1 into 6/4 favourite. Pulled up at this venue on St Patrick's Day at Grade Three level, here from the front Joseph O'Brien's charge didn't have much trouble in disposing of second market choice Dolly Dancer by two lengths. "She had loads of experience and is an honest mare. The ground didn't suit her the last day and I actually think she is a far more efficient mare on better ground," said Shortall. "She jumped well, showed a good attitude and did it well in the end. Hopefully she goes on to bigger and better things now." Arkwrisht is likely to lead Joseph O’Brien’s challenge in the Boylesports Irish Grand National. The nine-year-old’s form this year is not too inspiring, but O’Brien is pinning his hopes on the fact he still held every chance 12 months ago in the race when hampered at the final fence — eventually finishing sixth. O’Brien may run as many as four in the Easter Monday marathon. “Arkwrisht, Vieux Morvan, Slowmotion and Shady Operator would be the ones we have for the Irish National — although the last two mightn’t get in,” said O’Brien. “Arkwrisht was a bit unlucky in it last year, and if he came back to that run he would have a chance. Joseph O’Brien is hoping Le Richebourg will return to action next season as good as ever. The JP McManus-owned six-year-old had been a short-priced ante-post favourite for the Arkle Trophy at the Cheltenham Festival last month, only to be ruled out by injury in late February. Le Richebourg won four of his five outings over fences, including two at the highest level. “Hopefully we will have him for next year,” said O’Brien. “He is in Martinstown (McManus’ stud farm) and he won’t want to leave there as they get looked after so well! “It was a sickener, but these things happen. 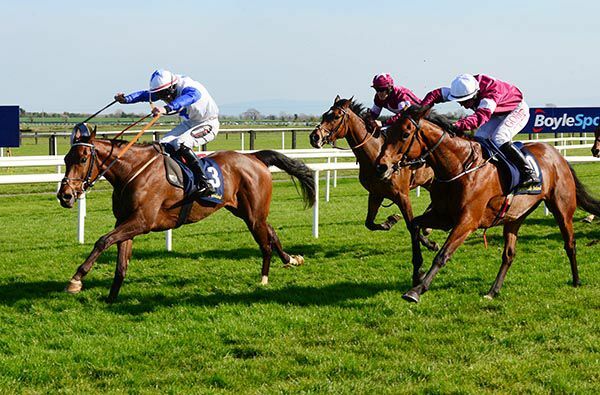 Buckhurst looks to be a horse that connections can get excited about throughout the new season after his debut run at Leopardstown on 6th April. This is a race which has been won in the past by Irishcorrespondent before that horse went on to finish 3rd in Churchill’s Guineas. Buckhurst’s next target looks like being the Group 3 Derrinstown Stud Derby Trial. 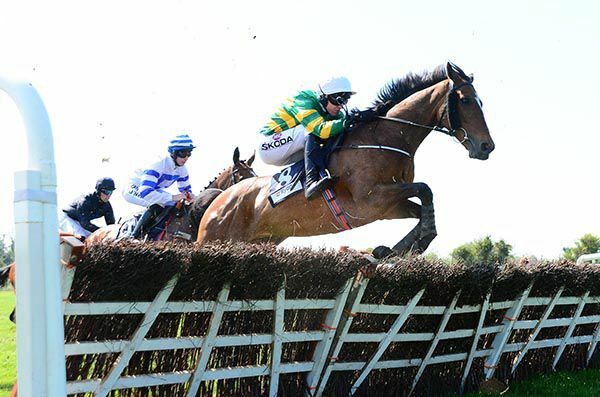 Joseph said: "We thought last year that he was pretty good, but he had a setback and pulled a muscle.I'd imagine Buckhurst will go for the Derrinstown Derby trial in a few weeks' time at Leopardstown on May 12th.He's obviously got options across the water as well. He's a little bit behind now, as he's had just the one lifetime start. He's a nice horse and if he happens to make the Derby, great, but we won’t force him." Buckhurst holds an entry for both the Epsom & Irish Derby’s. Joseph added: "We'll take it one step at a time. 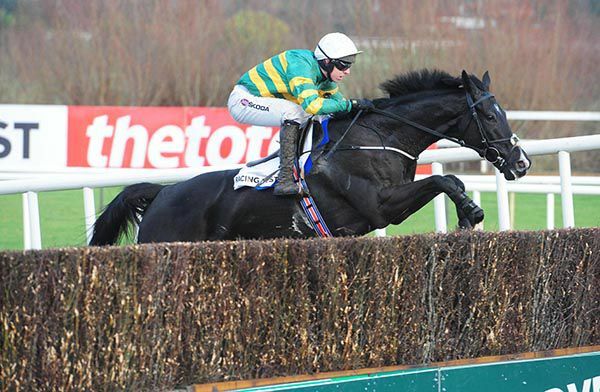 He's probably going to meet Broome back at Leopardstown, which would probably be a big ask on just his second start but, like I said, we'll give him the chance to be a Derby horse and see how things work out." Latrobe is likely to make his seasonal debut in the Group 3 Alleged Stakes at Naas on Saturday. He was asked if he thought that Latrobe was a stayer? Joseph said: "I don't think so. I think a mile and a half could be his optimum trip. He's got a big cruising speed and a strongly run mile and a half is what he wants.The Tattersalls Gold Cup could be an early-season target and we can regroup after that. He's a huge horse so you'd have always thought he'd make a better four-year-old. Hopefully he does." Latrobe also holds an entry in the Group 2 Coolmore EBF Mooresbridge stakes held at the Curragh the scene of his Irish Derby success. Iridessa,the winner of the Group 1 Fillies' Mile at Newmarket in October last was no match for Lady Kaya on her seasonal debut at Leopardstown last weekend, but Joseph is keen to aim her at the Group 1 Qipco 1,000 Guineas. Joseph said: "I was very happy with how she ran at Leopardstown over the weekend and the plan will be to head to the 1,000 Guineas at Newmarket with her now. She doesn't look like an Oaks filly but she's by Ruler Of The World and I guess we'll just have to play it by ear with her. I wouldn't be rushing to a mile and a half with her, We’ll see about the Oaks. Her grand-dam (Starine) was probably a mile-and-a-quarter filly, while Ruler Of The World was obviously a mile-and-a-half horse. Iridessa also holds entries in the Tattersalls Irish 1000 Guineas & the Irish Oaks. Of his 2 year olds, Joseph said : "I like the what I see, we've got around 70 of them. We've two-year-olds by Gleneagles, Guitafan, Muharaar, Golden Horn, Free Eagle and American Pharoah, and I'm looking forward to getting them started." Joseph could have his first 2 year old runner of the year on Saturday at Naas as Phase After Phase is entered in the first. Joseph was relieved to see his new recruit pick up where she left off when landing the Listed Noblesse Stakes at Cork on Sunday. King’s Field won three races for Joseph in the Sun Bloodstock colours last season and was last seen running in Dubai in January. Joseph said: “King’s Field is one of the worst home workers that I have in the yard. He is rated around 105 now, and we will probably train him for the Hunt Cup at Royal Ascot. Joseph has enjoyed a staggeringly impressive start to his training career — enjoying Melbourne Cup glory and Cheltenham Festival success to go with his multiple Group and Grade One triumphs. 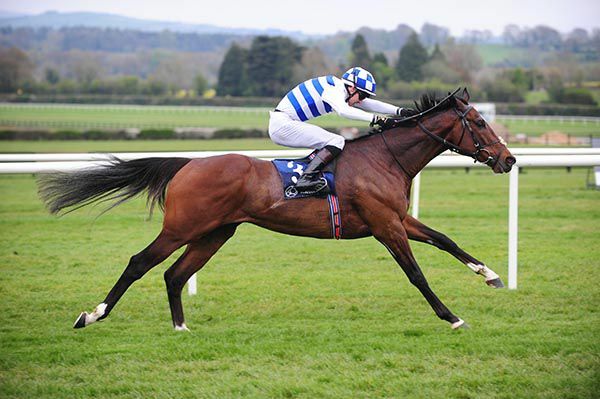 Cimeara landed the feature at Cork, the Listed BetVictor Bet 5 Get 30 Offer Irish EBF Noblesse Stakes, on what was her debut for Joseph O'Brien and owners Sun Bloodstock. Successful at Group 3 and Listed level last season when trained by Jim Bolger, the daughter of Vocalised was then sold for E500,000 at the Goffs Champion Sale in September. Sent off a 7/1 chance this afternoon, the bay four-year-old raced mainly in second under Donnacha O’Brien. She was ridden to challenge over two furlongs out and soon gained a narrow lead, keeping on well in the closing stages to score by half a length. Who's Steph, who was sent off the 11/8 favourite, ran on well to take second under Colin Keane for Ger Lyons, while the front-running Warnaq (7/1) was another half a length back in third with Robbie Colgan aboard this one for Matthew Smith. The winning trainer said afterwards: "Obviously she was a good filly for Mr Bolger last season and it is nice to get the season off to the nice start with her. She stays well and her best form last year was at a mile and six and we'll step her up in trip now as the year goes on. "We didn't expect her to win but she has done well with a penalty and the Vintage Crop Stakes at Navan is an option next. Her main objective this year is to win a Group 2 race as she has already won a Group 3. "Donnacha was grand after his fall at Leopardstown yesterday. He was lucky he didn't get a kick or anything and he has plenty meat on his arse!" 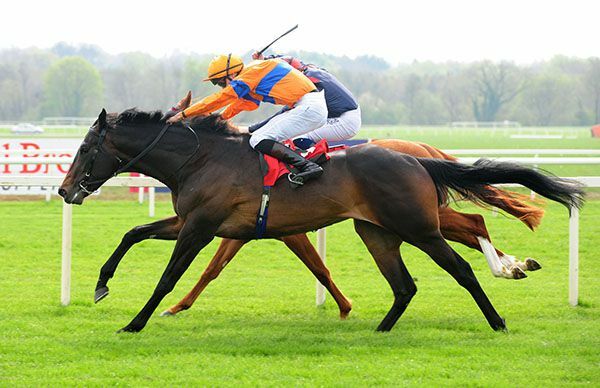 Joseph O’Brien picked the pocket of his father Aidan in the opening Leopardstown ‘Summer Sizzler’ Maiden. The Carriganog Racing newcomer Buckhurst (4s into 7/2) got there at the line to prevail under Donnacha O’Brien. With Lancaster House a non-runner Ryan Moore switched on to Jack Yeats and he was popular in the betting, halving in price from 8/1 into 4/1. This Galileo colt tried to get it done from the front for Aidan O’Brien but he couldn’t ultimately cope with the finishing burst of Buckhurst. Just a nose split them. Buckhurst is a son of Australia, owned by Lloyd Williams. Of course himself and O’Brien enjoyed a never to be forgotten day when Rekindling won the 2017 Melbourne Cup. “He's a very nice horse. 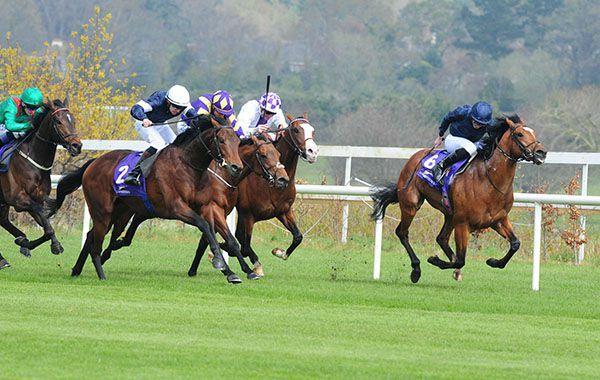 I was a little bit surprised that he won at a mile first time, off a slow pace,” said O'Brien. “Donnacha was very happy with him. I'd imagine we'll probably step into a Derby trial now and go from there.